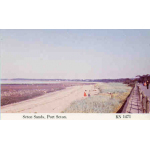 Slide depicting Seton Sands Camp, Port Seton. Postcard depicting Seton Sands, Port Seton. A number of people are on the beach.